The Snohomish county health department has agreed that the regulation as written seems to have several problems; while it describes ways to feed garbage to pigs, that seems to conflict with their requirement to have the material be stored in "rodent proof containers". You can have one or the other, but not both. "garbage" isn't defined in this statute, but it is in federal law. Garbage contains meat or slaughter offal -- this is solely vegetables and fruits. I don't think that this material is properly regulated by the health department as it's not garbage as defined, but they believe it is. They agree that it may not fight into the "public or common nuisance" as described by WAC 246-203-010. Well... the health department has asked me to work with the Snohomish county conservation district to either develope a protocol or a farm plan to allow the feeding of fruits and vegetables to pigs or other livestock. Yep. So one agency refers me to another agency, and now I get to work with both of them. My biggest gripe is that these guys seem to think that i have all the time in the the world (not to mention willingness to pay legal fees and costs) to work with them. Each of these agencies has the belief that their demands are reasonable. "Were only asking for 10%, after all!" but the cumulative effect of dealing with all of these guys and their agendas is a tax that I am really hating having to pay. I'll keep you apprised as always. Another government department has taken official notice of my farm. I got a "notice of violation" for "improper handling of solid waste" from the Snohomish County Health Department. What waste are they speaking of? I've had plenty of agencies bug me about my farm, so I'm getting kinda blase about the whole thing. "What would you like me to do to address your concerns" is a pretty good starting point. "We want you to put the solid waste in rodent proof containers and to have it removed every week at the minimum. " ah. If it's rodent proof the pigs can't eat it, either. Kinda defeats the purpose of the feed. Would you rather it be be fed to animals, or go directly into the landfill? So I retained an attorney for this matter. I did ask how they came to come to my farm. "We received a complaint". One complaint, I asked? "yes, one. " "For the purpose of these regulations, a public or common nuisance shall be considered as that which is set up, maintained or continued so as to be injurious to the health, or an obstruction to the use of property by interfering with the repose, health, safety or life of any considerable number of persons." One complaint. 55,000 cars drive by my farm every day, and one complaint in 6 years. Someone I just don't get "...interfering with the repose, health, safety or life of any considerable number of persons." I update this every year to keep everyone current on the costs of raising your own pig. You'll find last years version here. Question from email: "I'm interested in raising my own pig to eat. What will it cost me?" For pigs, the cost of raising is pig is the cost of the newly weaned pig + the cost of the feed to bring the pig to market weight + the cost of the pen to keep it + the cost of the labor. I'm going to ignore the cost of your pen and land, and talk about just the money you'll need to spend to feed the pig to market weight. In western Washington, where I farm, a weaner pig will cost you $100. This is up $15 from last year, and it's a reflection of low supply and high demand. Some folks are paying $125 in the spring for a weaner. It will take between 600 and 800lbs of feed to get that pig to market weight at $400/ton (July 2011 price). 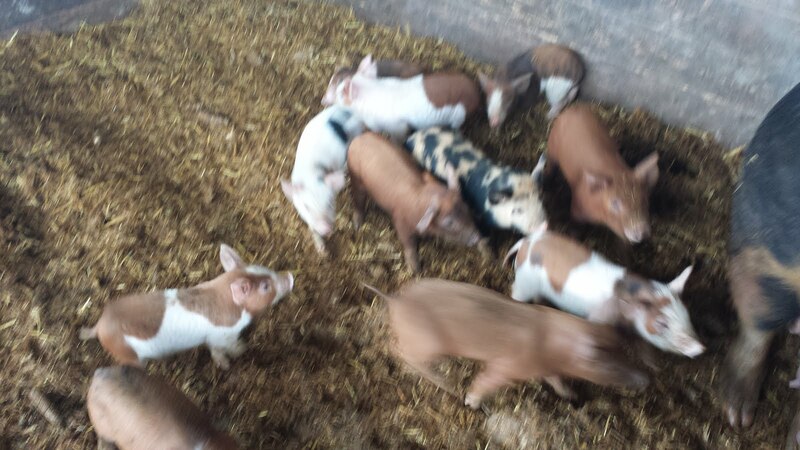 Using the higher weight, that's $160 in feed, giving you a hard-cost (piglet + feed) of $260. This is up substantially since 2010, when feed was $290/ton. Having someone come to your farm and kill the pig will cost $55, and for that price they will shoot the pig, skin it, gut it and split it down the backbone. For an additional $0.55/lb they'll cut it into your pork chops and roasts and so on. Butcher costs haven't changed since 2010. Adding it all up, you'll pay $260 for the pig and feed, $55 for the kill, and $110 for the cut-and-wrap, for a total of $425. This will yield approximately 150lbs of meat, for a cost per lb of $2.83, up $0.40/lb from last years number, with the majority of that increase due to higher feed and piglet costs. "Hey Bruce was just reading your blog and had a couple of questions for you, I hope you don't mind the email. There's an organic dairy nearby that sells their Holstein calves, and I'm thinking about getting a couple, one to raise as a milk cow and one to raise for meat. Was thinking I would use the bull to breed the heifer @ 14-15 months and then butcher him, rinse and repeat each year. " That's pretty much the standard dairy cow dance; the cow needs to give birth periodically to continue to produce milk. What you're proposing is pretty standard. What you're missing is my experience with dairy bulls: Hands down, dairy bulls are the meanest bulls i have ever encountered, as a group, and a bottle-fed bull would be even worse than a dam raised bull. Bottle feds have no fear of you, and they get really big. "How long are you raising your Holsteins before butchering? Could you estimate how many pounds of hay it takes to get them to market weight? What weight do you butcher at? We bought a 1/2 steer this year, 1200lbs on the hoof, our half was 600lbs, 325lb hanging weight, and we got back 188lbs of meat including packaging. For a family of 7, that doesn't last long. Anyway, I have no idea what market weight for a cow is, and I've no idea what breed steer we bought, but I'm sure it was a meat breed." I prefer to eat an older cow; and the holsteins benefit from additional growth time. The reason that holsteins sell at a discount is that at the same age the percentage yield of a holstein carcass vs a beef carcass is lower. I've found that holstein beef is very tasty -- with some notes, below. (I don't know if these are the first cows you've raised for beef, so if you can't answer some of these, I understand.) If I did my plan, and didn't castrate him, is there any issue with beef from an intact male? I know there is supposedly boar taint, but I've not heard if cows have something similar. I can of course, make a bull calf a steer, but part of the appeal is to be able to breed him to the cow to keep her in milk LOL." No issues on the beef from bulls tasting different, but behavior of an bull vs a steer is pretty dramatic. I'd talk to your local dairyman about their bulls and experience. I purchased 4 bull calves, bottle feed and castrated them, and eventually ate this one because it was annoying my girlfriend by being too aggressive, and then ate this one because it got hit by a truck on the road in front of my farm. Unfortunately for me, both of the cows that I ended up eating were just coming off a diet of mostly hay. The one that got hit by a truck was still on hay because of our cold, wet spring and lack of grass, and the other one just had to go, so we ate it. Both steers were SUPER LEAN, which sounds like a good thing, but actually wasn't. It was very dry, and not very enjoyable. The next one I slaughter will be this fall; probably in December, and I'll be feeding it some grain prior to the slaughter. A quantity sufficient to add some fat to the cow and for a duration sufficient to get some marbling going. I've eat lean, grass-fed Holstein, and while I appreciated it, and it's tasty, isn't just not my thing. Bottle feed and wean to grass at 3-4 months. Grass and hay for the first 2 years, some minerals, salt lick, occasional treat (spent brewers grain, for instance). And for the final 4-6 months, 10lbs of feed per day as well as all the grass it can eat, with slaughter timed for the end of the growing season. Say hello to Dan and Sean. They're both doing a great job on the farm, and I thought it was time to give them credit. Whether they're up to their knees in mud or their elbows in blood, I've appreciated their work and effort, and they deserve the credit for a job well done. Thank you both. There are a lot of farms that offer "internships" -- basically free labor with some sort of arrangement for housing and possibly food -- with the theory that what you'll be learning is your primary pay. I think that it's an interesting idea -- but I personally don't think that it's fair, or even appropriate. This might piss some folks off -- but if your farm isn't producing enough income to pay at least the minimum wage (or more, if you can) is that really something you want to hold up as an example of what a farm should be? The most sustainable farms are those that make a profit and continue to exist, and if you're really going to take someone and teach them, take the time and care to teach them something that works. And to me, if you can't afford labor, it's not working. So the next time you see someone offering an "internship" -- think about it. It's just not sustainable to have a model that depends on free labor. We've finished the primary haying for the year; picked and stacked 21 tons of hay. That's up from the 14 tons we put away last year. We're carrying a few more animals, but mostly the price was good and what we don't feed can be used as bedding, even next year. Here's a stack of 300 bales. We ended up with 700 bales, about 60lbs each. Maybe a few more than that. Enough to fill 2/3rds of the hay barn. I put up more bales this year because I'm able to sell them for $5-6/each in the winter. Horse folks seem to forget that their horses eat all year long, and as a result there's always a demand for relatively cheap hay, and local grass hay at $5 a bale is just the ticket. Stacked in my barn, including labor costs and allowance for breakage and spoilage, they cost me $2.38/bale. So if I sell half it pays for the other half. I'm betting on horse people doing what they always do. Been a safe bet so far. My hay guy has had problems with his baler this year; so we had more breakage than usual. Here's an example of a bale that isn't correctly baled. So I talked to him, and the bales we didn't take we cut the strings on, and he re-raked and re baled it, so he get some use of out of it. Here's my new hay hauler. It's a 2000 ford F450, an ex-utility truck. I think that this one was the power companies. It has 60,000 miles on it and cost $8,000 at the auction. Works pretty well, put it to work the day after I bought it. Comes with a hydraulic crane on the back and the bed is all-aluminum, so it won't rust and doesn't weigh much -- more payload. We stack that trailer 6 high before we're done. And there was a whole lot of work to be done! In 1987 I was working for Microsoft, and had been for a year or so, and the stock market crashed while I was there. I was relatively young; I think I was 23 at the time, and as part of the hire process I'd been given a block of stock. What was funny about that time was that someone had written an application which would sit on your computer and constantly track the stock price, and it was later expanded so that you could put in the number of shares you owned, and your option price, and it'd calculate your net worth hundreds of times a day. So that folks would watch the stock price and be very pleased when it went up a quarter or a dime, and you'd hear people hoot when the stock price went up. But that changed on Black Monday. The stock market lost 22% of its market value in a SINGLE DAY. To put that into perspective, that's like the DJIA losing 2,640 points today. So the loss of 500 points day before yesterday is a pretty small echo of that single day. But the effect on my co-workers who had this little application telling them their net worth (and in the minds of many, their value to society - it was that important to them!) was profound. They set up televisions in the cafeterias and in the conference rooms and on black monday, not much work was done. Lots of pale faces. Lots of worried people. While everyone I know was worrying about the 4% drop, I spent the day bucking hay, and scalding and scraping a pig, and generally enjoying myself. I'd heard the news the market was dropping, and I really didn't care. I don't care about the market because I fundamentally don't trust it. There's been too many insider trading scandals. Too many billions made by investment banks or hedge fund operators; by scandalous mortgage practices and by speculators. All of this moving money around and not much doing. I invest in stuff that I understand. I understand land and real estate. I understand businesses -- some businesses, anyways -- and I understand people. So I work with that. What the market does is not really a part of my daily life, and I've intentionally distanced myself from it. Because I learned, during that day in 1987, that if I pin my hopes to some random number that it can ruin my whole day, and I only work with things that I understand, and I'm much happier as a result. I get asked what I feed my pigs, and so here's pictures of the pigs menu today; mostly strawberries; a few oranges. Some romaine. Maybe 5 tons of strawberries. The strawberries come to me frozen. They're frosty, and in fact, the oranges and strawberries would make a pretty darned good sorbet. They smell good as I load them on to the trailer. There's other fruit mixed into the load, but the bulk of it today is strawberries. A pile of strawberries 3'x7'x16'. More than a cord of strawberries. Strawberry fields forever. Spent part of this weekend on the one sunny day, putting hay away. Only put 200 bales away, which amounts to 200 cow days (roughly a months supply) and stopped when it started raining. Looks like i'm going to have to order a truckload of hay this year if I want to have any in the barn. The hay guy was having problems with year with his baler. The knotter wasn't working correctly, and we ended up having quite a bit of wastage. The tractor is outfitted with a plate of 1/4" steel in the front bucket to facilitate the loading of the hay, and we've hooked up the pig carrier in the rear. Allows us to pick up 600lbs of hay with the bucket and another 800lbs with the rear as we carry it to the barn and stack it. The plate is secured to the bucket by tabs welded into the interior of the bucket and a big screw that we use to clamp it to the side.